Girl Baby shower in yellow and pink colors. 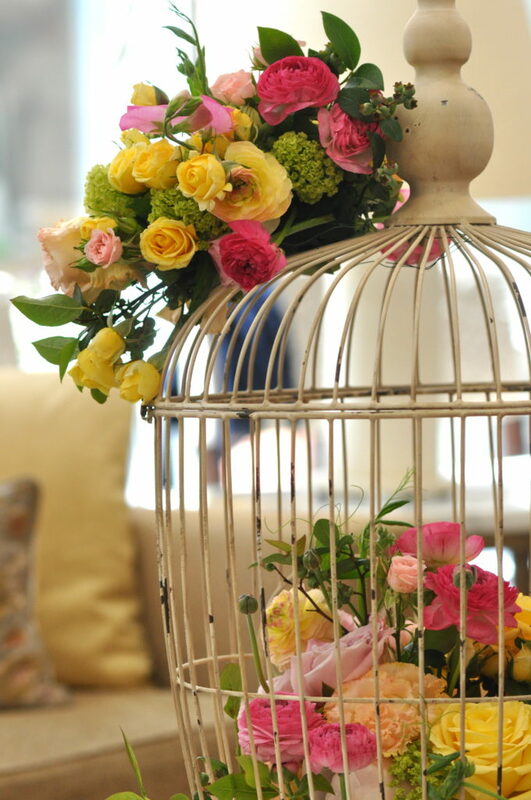 The mom loved vintage pieces, so we decorated little antique white urns, rustic birdcages and lanterns with garden inspired flowers. For the cake we wanted to go more elegant and modern than you typical baby shower cake so we modified a bridal cake and topped it with cute Chanel baby shoes with a bit of sparkle. We also added little details like mini cupcakes, a wishing tree, mini lemonades, candy jars......all in the color scheme pink and yellow. For the background we created a painting using stencils with birdcages, trees and bird patterns. It hard to say, I would say I dont have a particular style as I adapt myself to the project. But I love to create elegant decorations through simple details. Loved the birdcage and the cake! Focus on the small details. Guests love small details, like mini finder foods, small flowers arrangement, small serving plates. Also simplicity can be elegant. Choose your color scheme. Either you go with bright colors like pink and yellow or more pastel with lavender, white and green.... Source Ebay for cute vintage objects or go to your local flee market. Also dont be intimidated, go to your local scrap booking store and you will find tons of ideas and easy to do projects. I would love to have that cake as well. That is sooo lovely. Cute thing you did with the birdcage, by the way. I loved this concept. Very feminine and she had all the details covered!